FREEDOM! Yes, a bit of Braveheart-channeling. Childhood was fun. Family, school, friends. All was well. The teen years were, well, let’s face it horrible. With no idea who I was or wanted to be, I sat stuck in the in-between world of who-the-heck-had-a-clue! The world opened the curtain just a bit, giving a sneak peek of where I must venture after leaving the safety of childhood. That scared the bleepity-bleep-bleep out of me even more than the monster under my bed. I’m not one to jump into anything. I sit back, I watch, I listen. Change frightens me. But that’s what my twenties brought, the years of change … college, marriage, and moving to a different state. Hello, world. Years of fear as I stepped away from everything I knew. The shy, dateless wonder found a boyfriend. Whaaaat? I know! But for months I was scared to death to let him kiss me or hold my hand. College ended, I got married, moved, and months later, hubs and I bought a house, into which I retreated. A new place, new everything had me frozen in fear. My mid-twenties brought depression. I had nothing to give the world with still no idea who I was or what I wanted. My hubs didn’t understand, I didn’t understand. My family was far away. No friends. No job. I only existed as a wife. But what about me? My life had no purpose. So I fled into the world. I volunteered, painting sets at the local theater and becoming a Big for Big Brothers/ Big Sisters (a story for later). I got a full time job and joined a kickboxing class. Sounds like a lot? I know. That was the point. Home was full of sadness and I didn’t want to be there. Have you ever seen the movie ‘Yes Man’? Exactly! I said yes to everything, eventually learning what I really wanted. Wisdom? No, I had no idea that I had found a solution. Only looking back do I see what I had done. A bit of magic. At the end of my twenties I became a stay-at-home mother of two. Wow. With age and motherhood comes complete terror. Babies scare me. But I, finally, had enough faith in myself to tackle the challenge. So I entered the land of thiry-something and the world began to make sense. The mom thing was going well, slightly insane, but healthy and happy. And I knew what I wanted to be when I grew up! A writer. And typing all the words felt good. Creating all the characters and worlds, filling pages and pages with crazy notes, made me happy. The work of stay-at-home mom kept me busy (still does). Through all the kids’ activities and housework, I continued to make stuff up and write it down. Then came another big step, venturing out into the land of queries, of putting your work (so basically yourself) out there. So, as usual, I waited, I watched, I read books and took classes on the subject. I wrote and wrote more. I entered story contests, earning honorable mentions and eventually placing ninth. Hmmm … maybe I could do this writing thing. I submitted to a magazine and had a short story accepted for publication, causing the joyous scream heard ’round the world. A new sense of me emerged. Of course, wrapped in the joy was the pain of rejections like a knife to the heart. I was invited to come to a writers’ group. Hmm … a place to read and get feedback. That sounded new and fun and incredibly scary. But in the wonderland of thirty-something, I had gained a bit more magical freedom of me. Lately, I just don’t worry about all those things 20 or 30-something me stressed about. So what if I fail? Failure only means I’m trying, which can lead to ALL THE DREAMS. So now. I get a rejection and shrug. Not the first, not the last. You don’t like my writing? That’s okay. I love getting comments on my work, whatever you got, bring it on. Every critique helps make my writing better. I have settled in to my writers’ group, who have accepted me even after I revealed my true (completely crazy) self. A group forms on Twitter? I jump on board. A writing contest? I’m in! And a blog … why not? 20-something me would have run and hid. Did I get wiser? I don’t know. I’d like to think so, but really I found a love of me, the creative, slightly talented, insane world of me. Just add fairy dust, I could fly. The opinions of others can’t take my power. Not that I don’t care what people think, because I do, but not to the point where it brings me down. I’m old enough to be happy in my own skin, to be free. Defying Gravity is my favorite song from the musical ‘Wicked’. I have been playing it loudly and often in my car. You should hear me belt out that tune! Or not. Here’s a bit, just let the words set you free. Have you reached the age of freedom? Isn’t it great? I stared at her in shock … surprise held my tongue. These ideas have always occupied my head. Why, for heaven’s sake, doesn’t everyone think this way? I forgot, as I always do, that not everyone has the same twisted ideas tumbling through their minds that I have in mine. Isn’t it great? *flails* It is! We go through life thinking, wondering, talking to ourselves (or maybe that’s just me). Every once in a while,we are reminded that what is perfectly normal to us is completely odd to someone else. Our minds are set up differently each equipped with filters, as unique as we are. Ideas weave through our heads. The goings on of the world seep into our brains. Every idea, every subject gets sifted, sorted. Our filters catch some things and let others fall away into oblivion. History, politics, or scientific principles, pretty much the straight and narrow, the workings of real life enter my brain, stay for a second, but get filtered out eventually. However, anything fantastical, magical, scary, or insanely weird are free to wander aimlessly through my mind forever. You’ll find a real shindig inside my head. My filters tilt to the side of wonky, possibly created from the wood of a Narnian tree, or exist in another dimension. Our filters can’t hold everything. Our heads would explode. Only the ideas that add to our joy stay wrapped up safe in our minds. The magic of individuality. We’re born with our filters. However, our childhood … what we experience, how we are influenced, the people in our lives help shape them. My mother showed me the magic of this world, the real world, as in nature and people, not the inner workings of the Government. Always hanging back, taking her time, she’d notice every bug, flower, and leaf. Mom would point out the marvelous wonder of the stars, the way the sun paints the sky at sunrise and sunset. The joy of friends and laughter, the wide world of all the things to try … sports, art, music, stories, places to go, and experiences to have. Thanks to her, I marvel at the change of the seasons, never willing to live where I don’t get all four. The Hallmark Channel entertains me (especially during the Christmas season) because my mom passed on her love of happy endings. Hence the existence of my girlie filter woven of a net of happy tears. My dad introduced me to the magic of elsewhere. Never one to change the channel, even when an impressionable child wandered into the room, he exposed me to all things not of this Earth. A story of an evil, blood-sucking demon or a poison spitting alien offered up a dose of fear to the unwary. My sisters ran. I stayed, drawn to the world of fiction … fantasy, sci-fi, and horror. My filter held onto all of it. I’d settle on the couch and ask, “What’s this?” I met Dr. Who that way. I fell in love with the Enterprise and Galactica because I stumbled upon their magnificent images on the small screen. I couldn’t look away from ‘Poltergeist’ at the drive in – the killer clown doll becoming one of my greatest fears. Dad handed me my first horror book, ‘The Talisman’ by Stephen King and Peter Straub. Wow, did that send me down a dark road of fun, ending, of course, in The Twilight Zone, where the strange and unexpected could happen to anyone. It’s obvious I was born to love these things, but my childhood world helped solidify who I am. 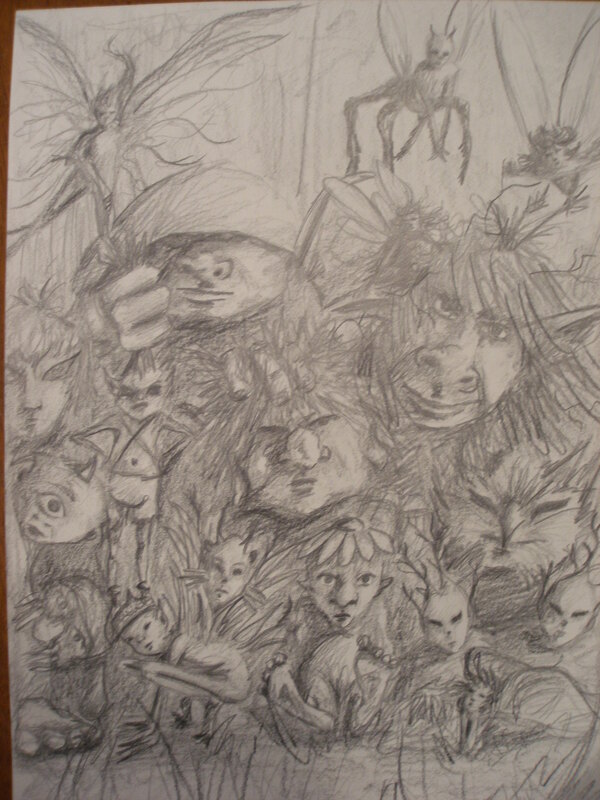 As a kid, I drew strange creatures and people then create new worlds for them. Scenes from stories in my head would make it to the page. Most of my drawings disturbed my mom, but my dad always gave an approving nod. A tree, ruins, or the wind can give me fuel to create a world and the characters to live there. All grown up, well, not quite, I see why the portal, taking me to the universe where I truly belonged, never opened. I am meant to share all my weird here. It is my purpose. One I love. So when I read my chapters set on far away worlds to my writers’ group, I will forgive those who can’t help but picture somewhere on Earth (just like I will forgive those who don’t know every fact about Harry Potter and give me blank stares when I mention Dr. Who). The fantastical and strange just fall through their filters. And that’s okay. I don’t write for everyone. Mainly I write, I create for me. But I do like to share with others whose filters happily hold onto all the weird too. And please, if you have created other worlds I haven’t traveled to, then share with me! Of course, I end up jealous that I didn’t think of it, but I’ll live. What does your filter catch, allowing passage into the twisting paths of your mind? Be glad its not the same as everyone else. Celebrate individuality … one of the best magics out there. I’m kidding! I like the holiday, but I have no interest in shooting you in the rear with Cupid’s arrows or force you to wear something pink and red, which would be a disaster. Roll your eyes at the day card, flower, and candy sellers have created just to make money. But this day holds a special place in my heart. Haha, heart! So I’m sharing my Valentine magic. Just sit still for a sec … *offers bag of conversation hearts* Yes, they’re the good ones made by Brachs. What do I do on this special day, set aside for lovers? Not much. I am married, have been for eighteen years, which, according to my husband seems like forever. So I do have that ‘special someone’, at least I do now. In the years before I met him, I had … let’s see … oh, that would be zero boyfriends, dates, anything romance/relationship related. Yup. I’m that awesome. Or possibly, just that shy. Flowers? Newly married, oh so long ago, I worked for a company that made bouquets. For years, I worked until midnight the week before Valentine’s Day getting stuck with thorns trying to ship out the millions of dozen rose bouquets. So, don’t give me flowers … like ever. Jewelry? Meh. The only flashy bling I wear is my engagement ring and wedding ring. Diamonds and gold just don’t mean love to me. A fancy dinner out? Please. That would take me away from my comfy couch and yoga pants and force me out into the world of people. And to be honest, people scare me. A simple card and box of chocolate? Now you’re talking. The morning of February 14th brought love from a very special man. My dad. Like most men, emotions aren’t his thing. Not so much with the hugging and kissing, not a man made of words. He shows love other ways, you have to know what to look for. On Valentine’s day, my sisters (two to be exact, yes, three girls total, so feel sorry for the guy), mom, and I would find our own heart shaped box of chocolates and a card sitting in a line on the couch. The most expensive candy? Nope. But it was magic … priceless. Because my dad took the time to buy them and line them up and pick out the perfect card for each of us. I still have them all tucked away. The words in those cards still make me smile, especially the word ‘Dad’ scribbled at the bottom. So now, as a mom and wife, I create my own magic by picking out the perfect cards for my kids and husband and line them on the couch with their heart-shaped boxes of chocolate. And they love it. Because they know I love them. That’s all Valentine’s Day needs to celebrate. Love in all forms. Wave your own magic wand, sprinkle fairy dust … let someone know they’re awesome not just today, but everyday. Well, the world didn’t implode, explode, or any other kind of ‘plode. I thought for sure, my venture into the world of blogging would end us all. Welcome to my little world, which I have named Finding Faeries, because I do believe in faeries … I do, I do. I am on constant alert for magic. As cliche as it sounds, magic is everywhere. So, you, lucky readers, my new best friends, can share my strange view of the world. My life as a stay-at-home mom consists of my husband and two kids (who need to driven everywhere and signed up for all the things), cats, grocery shopping, laundry, cooking, cleaning, reading, and writing. I know, sounds truly exciting, I sense you perching on the edge of your seat. And what is so magical about this terribly normal life? It’s all about perspective. Look on the bright side, everything happens for a reason, stay positive, it’ll all be okay … yes, I’m one of THOSE people. My husband would like to strangle me on occasion, but the fact that he hasn’t speaks volumes. Deep down, we all want to see the light, the good … no matter how dim and dark life can seem and, believe me, I visit that place every once in a while. So step back into the light, don’t give up the search for the fantastic. I shall embark on this new writing journey, a road covered in shadow. With my light of believing, I will follow and discover where it leads. What can you expect to find here, in my universe? Well, my inspiration comes from everywhere. Strange, but completely normal events spark an idea, a thought … kinda like magic. My life: Husband, kids, cats, chores … it can be tedious and frustrating, but only if I let it. Mostly, I find the daily grind hilarious. I’d even go as far as to say magical. Stories: For me, books and movies hold power, transporting me anywhere and everywhere, giving hope or just a fun ride, possibly changing what we think or believe forever. Magic (sensing my theme?). My imagination: The magic of creativity is endless. I write, edit, tiptoeing out into the world of hoping-to-be-published (also known as the world of getting-rejected). The way this process has changed me, made me who I have become, as well as boggling my mind, and I look forward to sharing the heart aches and soaring joy. So I invite you to come with me in my search for faeries. I promise to be completely myself and won’t apologize for the odd, stray thoughts that so often roll around in my brain. Warning – my mind will take the occasional stroll into the dark and scary shadows (I do love Stephen King). I love fantasy, magic, paranormal, and horror. I promise to share any fabulous books and movies I find, for not doing so would be mean. I am a Trekkie, Whovian, Harry Potter nerd, Browncoat, and am becoming a Sleepy head. I am not ashamed to refer to Little House on the Prairie, Lord of the Rings, Star Wars, or anything Narnia related. So if you like all or some of these, can I get a Woo Hoo? Nice to meet you. Thank goodness for computers and the Internet so I can remain on my couch and avoid being social. There is no life I know to compare with pure imagination. Living there you’ll be free, if you truly wish to be.